What do you and I believe about Christmas, really? When the church confesses its faith, it doesn’t say: “I believe in the virgin birth, the empty tomb, and the second coming.” We believe in a person –“Jesus Christ, our Lord.” Church doctrines dealing with Jesus’ birth, life, death, and resurrection are necessary if we are to articulate our faith; however, they are not themselves the object of our faith. Our trust, hope, and confidence are in Jesus and him alone. We need to take church doctrines about him very seriously, but we should never confuse even the most orthodox doctrines with genuine Christian faith. We may be comforted by the fact that faith in him can be real even though our ability to express that faith in words is always inadequate. We must be constantly vigilant during the season of preparation, Advent, and through the season of arrival, Christmas, that our main concern is about Jesus himself, not with our own or even the church’s sometimes confusing presentation of him—not the glitter and lights of the shopping malls—not even the ideas you and I think are right. During Advent and especially during Christmas we ask “Who is this person who stands at the center of the Christian faith?” It is significant that the Apostles’ Creed speaks of Jesus with verbs: born, crucified, raised, ascended, and so on. It doesn’t give us an explanation or analysis of his deity and humanity and how they are related. It simply tells us the story. This is also how the New Testament talks about Jesus. It gives no theological discussion about doctrines surrounding his life and its events. It simply tells us who Jesus is by telling and interpreting the story of what he said and did. He is the one who speaks with authority, heals, serves, loves, obeys, commands, forgives, judges, prays, suffers, gives up his life, triumphs, and rules. During Christmas you and I need to reflect on the meaning of his life among us … which means we must consider how Jesus chose to live his life and how his actions are reflected in how we live our lives. Only through our meditation on the meaning of his life and actions will you and I learn the secret of who he really is. The person of Jesus is inseparable from his work. You and I must never forget that Christmas is not an intellectual or even metaphysical puzzle we are solving, but the arrival of a life through which all history is interpreted … our lives included. So, “The Word became flesh,” John once wrote, and of all flesh this particular flesh: son of a teenage pregnancy, near victim of a ruler’s genocide, 1st century stone-mason and rabbi, prostitute’s hero, poor person’s Messiah, Savior-Healer of the world. Christmas means Jesus is the Word of God made flesh and we can take it or leave it. It is this birth, this life, this death, and this life again, through which God manages to say who God really is. I recently preached about God’s dreams for us. I used the story of Jacob’s Ladder found in Genesis. It’s a great story about how God reached Jacob through a wonderful dream. In it, God let Jacob know that there were great things ahead for Jacob: he would be given the blessing of offspring and land, just as his father Isaac had been promised, and his father’s father Abraham before him. But that’s not all; God promised to be with Jacob through it all. Not only does God have great dreams for us, God also has great dreams for Trinity Church. How do we figure out those dreams? We start by praying. We pray for guidance and for God to lead us to live out God’s will. It won’t always be easy, but we can take comfort and reassurance in knowing that God will never leave us. I hope that you’ll keep your church leaders and congregation in your prayers. 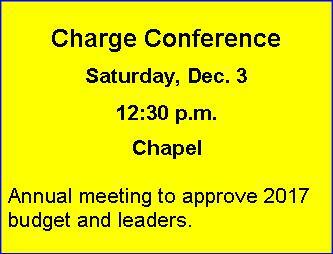 Just like the rest of the world, the church is changing. This is not the same church many of us attended as children; it is not even the same church it was ten years ago! You are an important part of the future of Trinity. It’s my prayer that you will join us as we work to live out God’s dream. The modern-day sports culture employs all of the tyrannical techniques that people claim are the reasons they don’t believe in organized religion: The pomp and circumstance. The empty superstitious traditions. The brainwashing that arbitrarily says we are better than you. The use of guilt to manipulate you into participating. The threat of exile if you don’t toe the line. The cultural dominance that automatically assumes everyone celebrates your holidays. To me, he was rephrasing the apostle Paul who advised his disciple, Timothy, “For physical training is of some value, but godliness has value for all things, holding promise for both the present life and the life to come” (1Tim 4:8). It’s common for many faith communities in Northern Virginia to feel like they are competing against sports. But I believe sports and church share some important goals; they help in developing self-discipline, character, persistence, organizational skills, and team work. I do not want to pit sports against church, but see it as one of the spiritual tools that aids in developing life skills. I ask that parents notice this all-encompassing tendency in sports and help children develop a healthy perspective toward athletics with respect to our journey in Christ. Posted on November 29, 2016 Categories Children, Education, Pastors' Articles, WorshipLeave a comment on Church vs. Sports? 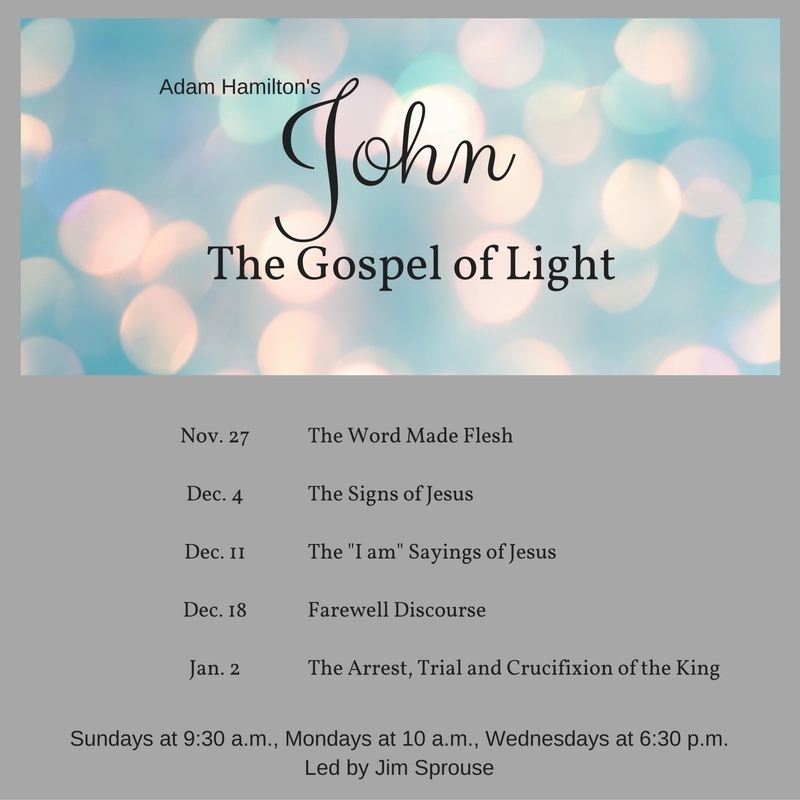 Dec. 11 The Case of the Reluctant Innkeeper, 10:30 a.m.
Dec. 18 Lessons & Carols, 10:30 a.m.
Dec. 23 Office Closes, 12 p.m.
Dec. 24 Christmas Eve worship: 5, 8, 10 p.m.
Dec. 25 Christmas Day worship, 10:30 a.m.
December is an exciting month for our Children’s and Youth Choirs! 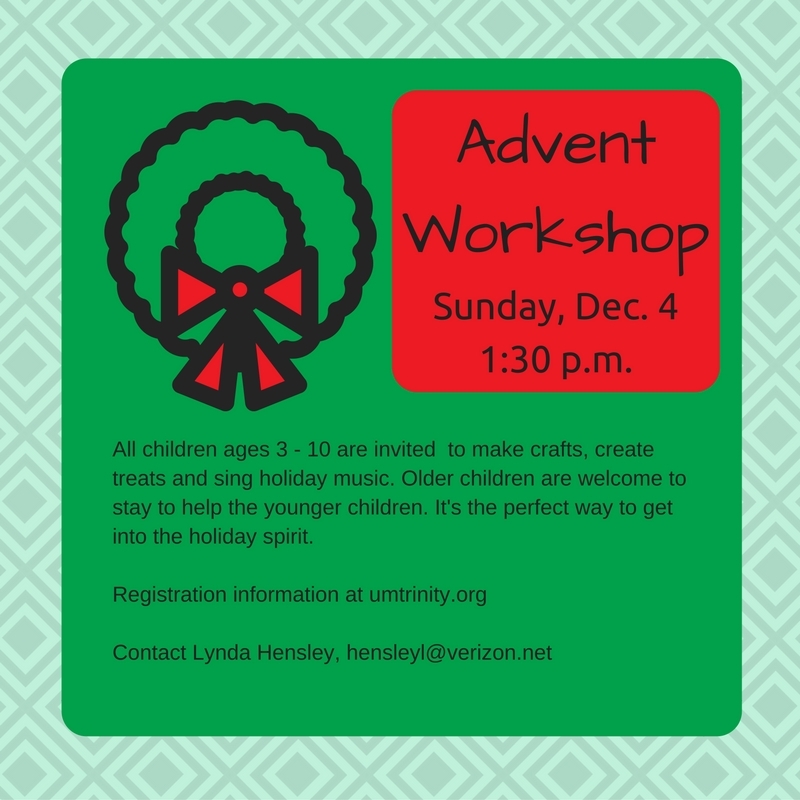 The Children will present their Christmas musical on December 11 during the 10:30 a.m. worship service. The Reluctant Innkeeper is a charming musical that puts the Innkeeper who denied Mary and Joseph a room on trial for breaking Bethlehem’s hospitality law. Judge Jody Justice presides and our choir acts as the jury. The overall message of the musical is that God can make even the humblest of locations, like a stable, a cathedral. He brings light into the darkness. The music stems from new songs that tell the story to medleys of classic Christmas hymns including Angels We Have Heard on High and Joy to the World. In addition, our Youth Choir is working on a song in Benjamin Britten’s Ceremony of Carols called Balulalow. They will sing this eerie lullaby during Lessons & Carols on December 18 at the 10:30 a.m. worship service. It is a challenging piece full of complex harmonies, in three parts with a soloist. Our youth choir, though small in numbers, is meeting this challenge with smart, musically inclined minds and voices. Our ringers and singers are looking forward to sharing the musical joys of the Christmas season with you! 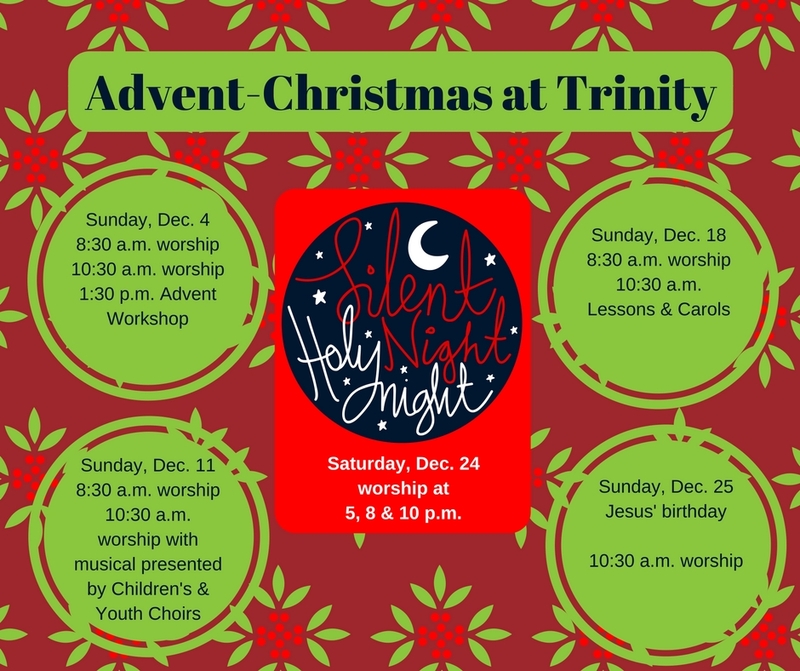 We will sing Medieval and Classical pieces as well as contemporary carols by Davis, Forrest, McChesney, and Rutter; we will also present settings of God Rest You Merry, Go Tell It on the Mountain, In the Bleak Midwinter and O Holy Night. 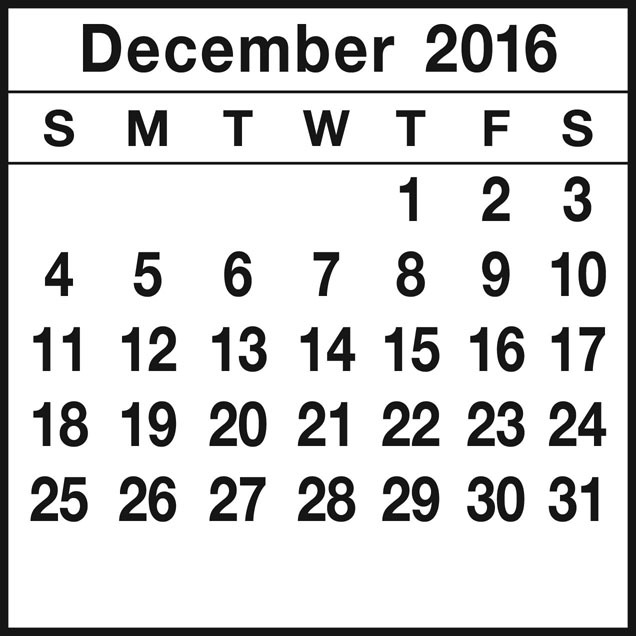 For Sunday, December 4 we will have a guest violinist at both services; the Children’s Choir will perform its Nativity musical on December 11, and on December 18 the adult and youth choirs will offer a service of Lessons and Carols. On Christmas Eve and Christmas Day, please bring your heartiest caroling voices to the Sanctuary to help us proclaim the birth of the Christ Child! 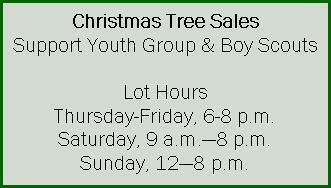 Please return your Share angel tree wishes by Dec. 4 at Church or by Dec. 8 at Share. Thanks so much for helping Share families have a Merry Christmas! Look for the H2H Angel tree in Fellowship Lobby during December to help orphaned children in Honduras. Turn your Christmas shopping this year into something more fulfilling than ordering online or trekking to the mall. Why not shop for a good cause at the Crafts for a Cause Holiday Bazaar, running Sundays from 9:30 a.m. to noon in the Fellowship Lobby? Everything we sell is made by Trinity members and all the proceeds go toward buying supplies for the Crafts ministry and to support Trinity’s missions in Honduras. You’ll find gourmet food gifts, handmade soaps and candles, artisan jewelry, Christmas crafts and even pet gifts. Meanwhile, the crafts group will meet for two work sessions this month – Mon., Dec. 5 and Mon., Dec. 19 from 7 to 8:30 p.m. in Room 124 to make the comfort items we provide to Fair Oaks Hospital patients. In addition, we will deliver 50 handmade flannel stockings and Santa hats as our special gift to families who welcome a newborn the week of Christmas. Special thanks to Nell Gilmore, Judy Osha, Zainab Kamara and Peggy Trapp for making the Santa hats. Church & Society and the Missions Committee are once again collecting Safeway Saver Stamps: These stamps earn us free Farberware skillets, stockpot, pans for our Church mission projects and for Share. Collection boxes can be found in the Fellowship Lobby and in the Narthex. We will collect them until January 3. Trinity UMC is planning a trip to the Heart To Heart Children’s Village next summer. Planned dates for our mission trip are June 30 to July 8, 2017. Heart to Heart is home to over 100 children and youth in Porte Cortez, Honduras. Most of these children have been orphaned or abandoned over the last 8 years. This ministry provides food, shelter and a Christian education to all these children and has been supported by Trinity through donations, prayers and mission trips since 2011. Our mission team will participate in a project as well as spending much time with the children and youth. Anyone interested in participating in this trip should contact Pastor Keith Lee or Chris and Dan Moore. Book Chat is taking a break for the holidays! 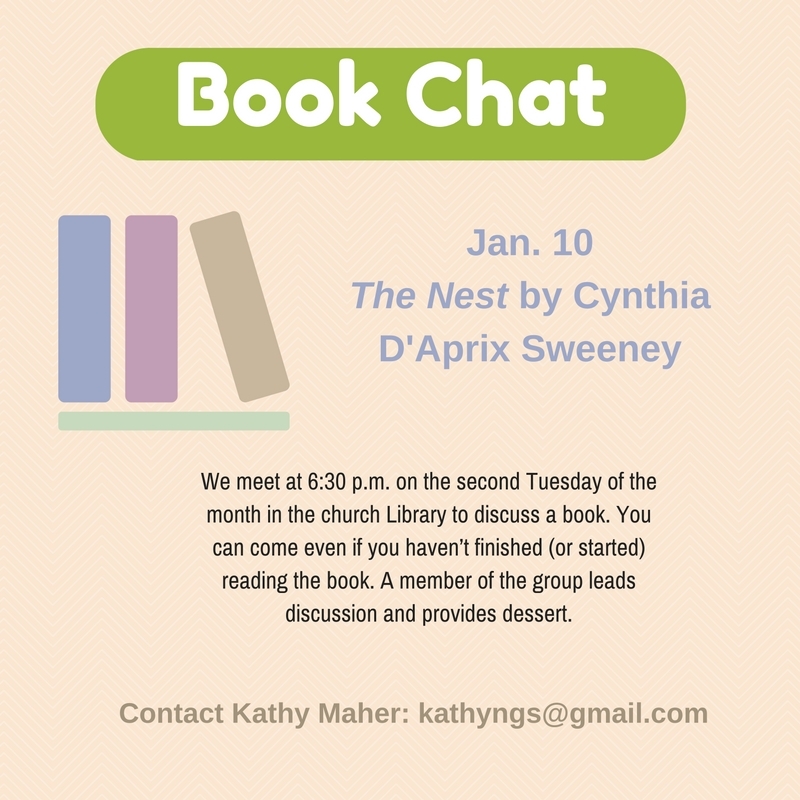 We’ll resume on Tuesday, January 10, with a discussion of The Nest, by Cynthia D’Aprix Sweeney, a novel about four adult siblings and the shared inheritance that has shaped their choices and their lives. Our meetings are at 6:30 p.m. in the Trinity Library. Bring a light dinner (dessert is provided) and enjoy fellowship and lively conversation. Contact Kathy Maher (Kathyngs@gmail.com) to be added to the e-mail list.